Creating a product or service and marketing it is the fun part. The real challenge is pricing that product or service. There are so many options and it can be easy to let this part slow you down completely; and yet you know that pricing your product or service incorrectly could result in no sales, which is the beginning of the end for a business. In this blog post I am going to give you a really useful and easy-to-use step-by-step model so you can understand how to price your products effectively. With this tool, and less than an hour of your time, you’ll know exactly what price to charge and you’ll even have some initial notes about how to position your product in your marketing and sales copy! A digital product like an ebook, report, e-course, etc. Now that we have that definition clarified, let’s talk about how you are going to price your offering. Prices are not arbitrarily determined (or, at least, they shouldn’t be!!!). The model I’m about to show you will help you find the best price (and marketing strategy) for your offering. It’s a simple, step-by-step system that can be easily accomplished in an hour or less. I realize that “competitive research” sounds about as exciting as an afternoon with an auditor but it’s important and it won’t actually take that long. I think you can get sufficient information in less than an hour. So turn on the music, pour yourself a big mug of coffee, and rock out your competitive research. Simply start by reviewing your competitors’ offerings that most closely match your offering. They don’t have to be exactly the same but they should be pretty close. If you’re selling a toolkit to help improve productivity, find other toolkits that help to improve productivity. If you’re selling a subscription to an investment newsletter, find other subscriptions to investment newsletters. (And if you believe that no one else is offering what you’re offering then you might consider broadening your research to include offerings that claim to deliver the same benefits to the same niche). Google your keywords and view the AdWords ads down the right-hand side. Click through to those sites to find competing products. Go to Clickbank’s Marketplace and review the products in the appropriate category. Go to Twitter Search and search for keywords related to your product. Go to Twellow, which is like a Twitter directory, and review users by industry then visit the product pages on the websites of people who are your competitors. Go to forums, portals, and resource websites where your target market goes and look at some of the advertising. As you do your research, you might end up with dozens of potential competitors’ products. List the competitors and their products but after you’ve reviewed several competitors and quickly looked at their products, narrow down your search to the top 10 to 20 products that are most like yours. The third price, column, is easy to fill out, since most of the time you can probably fill out the column while you are doing your initial competitor research. The fourth column, value, tends to be the more difficult one to review since we’re talking about perceived value and this can be subjective. 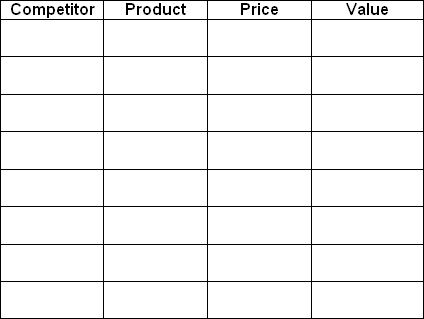 But all you want to do is get a sense of how your competitor is positioning their offering relative to all the other offerings that you’re looking at, so review each product with the criteria I’ve listed below and assign a “high”/”medium”/”low” value to that product in the fourth column on your chart. Is it a big product (a large ebook, some CD’s, a few resources) or a small product (a short ebook)? This sounds arbitrary but it’s a basic way that potential buyers perceive value. Lots of pages, chapters, lessons, etc. Review the sales page to see what benefits are being offered when a buyer purchases the product. Does it solve one small issue? Several big issues? Are the benefits specific (“you will earn 25% more profit”) or general (“you will earn more profit”)? The bigger the problem and the more specific, the higher perceived value the product has. Check out the bonuses offered with the product. Are there any? Are there a lot or a few? Do they seem relevant to the product? 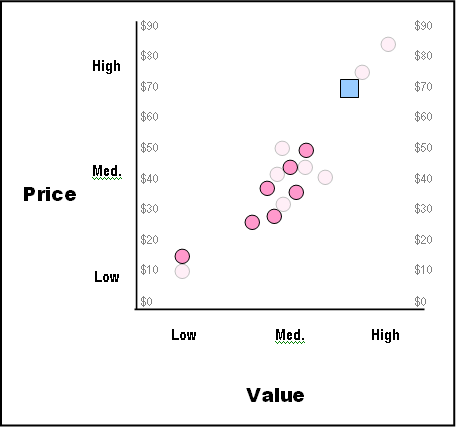 Compared to the other offerings you are reviewing, are they higher value or lower value? Find reviews of the product by searching online for the name of the product and reading what people have to say. How immediately applicable is the product? A higher value product might take more effort but will be immediately applicable. 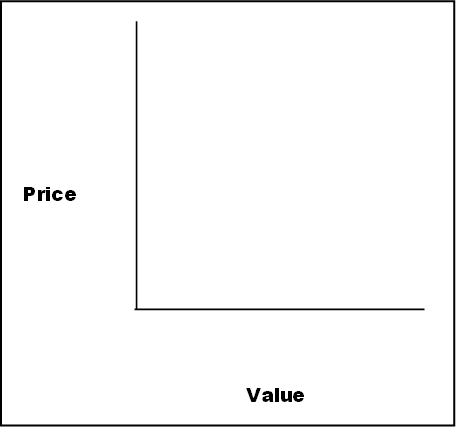 A lower value product might be easy to implement but may have a longer time taking effect. Does the product come as a stand alone product or as part of a series of products that the seller is offering? 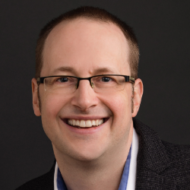 (In general, I’ve found that one product in a series of products can have a higher value than a standalone product because the seller has spent some time building a larger business around the suite of products). How experienced is the seller? Are they an industry insider with decades of experience or seemingly brand new? How are the testimonials? Do they seem authentic? Do they give credible numbers to back up their claims? These aren’t going to give you a perfect, measurable idea of value but they all contribute to give you a fairly accurate idea of perceived value, especially since you are making a relative comparison of all the competitors in your field. Here is where the magic happens. 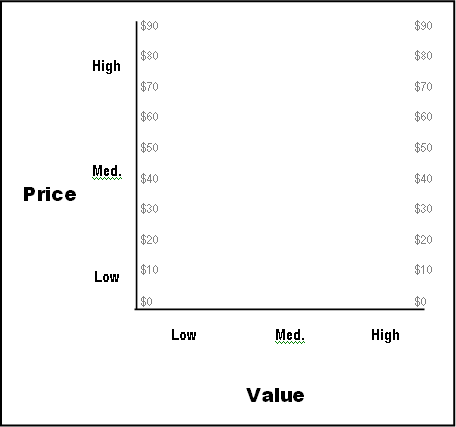 Now go back to your chart and fill in the price range. 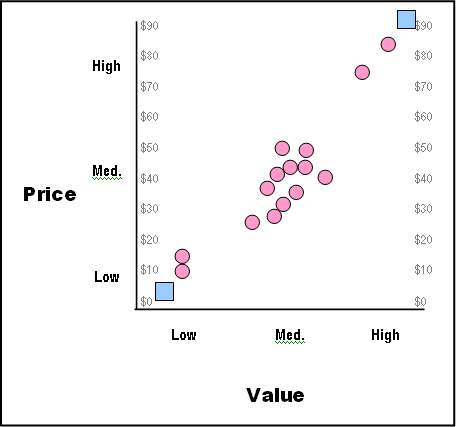 (I’ve used the price range of $0 to $90 in my example but your price range might be different. 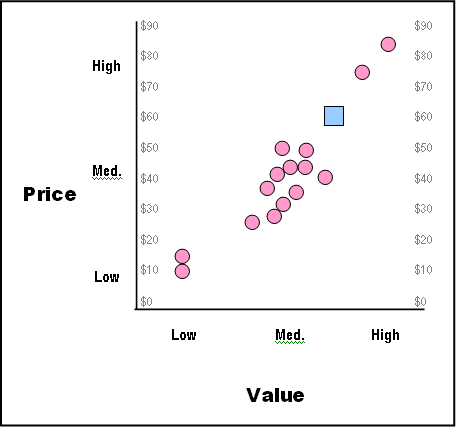 Start at $0 and plot out the prices as high as the highest price you’ve found in your research). 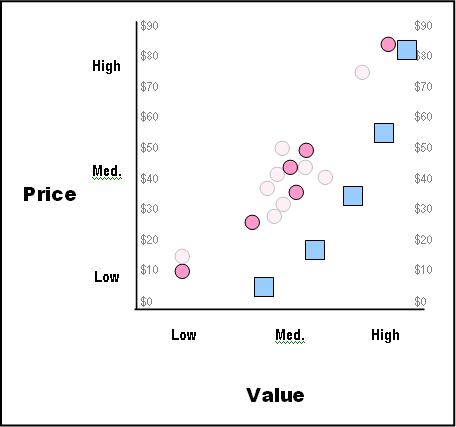 Now plot out each competitor based on the price of their product and their perceived value. I have plotted out 15 competitors in the example below. You’ll note that in my example I have a competitor selling a low-valued product for about $9 and someone else selling a similarly low-valued product for about $12. There are a bunch of competitors selling medium-valued products for between (approximately) $25 and $50. And, there are two competitors selling high-valued products at $75 and $85. Now it’s time to price your products using this information. Review the chart. Do you notice that your competitors are grouped in certain areas? It’s likely going to happen that way and the more competitors you research the more you will find this to be true. However, pay special attention to the outliers that don’t seem to fit into this chart because they are uniquely positioned and could be positioned that way for a reason. (I’ve shown 2 here to illustrate). Now it’s time to price your offering. If you have already created your product or service and have a good idea of the value you want it to deliver, this will help you to price your product. If you aren’t sure about the value it offers or if are still developing the product and deciding on it, look back to the criteria you used earlier to determine relative value. Do you have the experience in the industry? Do you have highly credible testimonials? Do you have an offering that solves a critical need? You’ll find that your price and value assumptions are fairly flexible at this point: You can increase and decrease the price; you can increase or decrease the value you deliver. That’s okay. That’s what this step is all about. This option is effective if your reputation is growing because the perceived value of your offering will slowly move higher. This is also an effective position if you’re a good salesperson and have a great marketer to generate leads. This also works if there aren’t a lot of competitors already (but you might not want to use it if the market is approaching saturation). Option 2 – Plug the gap: Position your product or service in line with the increasing-price/increasing-value trend but in a space where your competitors aren’t. This option is effective if the field is already cluttered with well-known options. However, be aware that the more cluttered the field is, the more aggressively your competitors will go after your position if they see you to be successful. Option 3 – Compete on price and value: Position your offering so you provide a higher valued-product at a lower price. This can be effective to enter the market but if you’re in a highly competitive market, you may find other competitors trying to compete on price by offering similar or higher value at a lower price. But if you want to get locked in early (and then sustain the advantage with great customer service) this can work well. 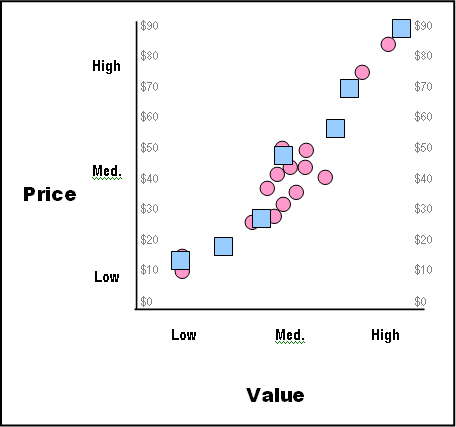 Option 4 – Offer more or less than what’s currently out there: Consider extending the trend even more, in one direction or the other so that you offer a lower priced, lower valued product than what is available or so that you offer a higher priced, higher valued product than what is available. You probably shouldn’t do both at the same time. Offer one or the other. This can be attention-getting. On the high end, you might find that your high end competitors aggressively go after you. On the low end, make sure you have some back-end products or services to offer because your margins will be really low. 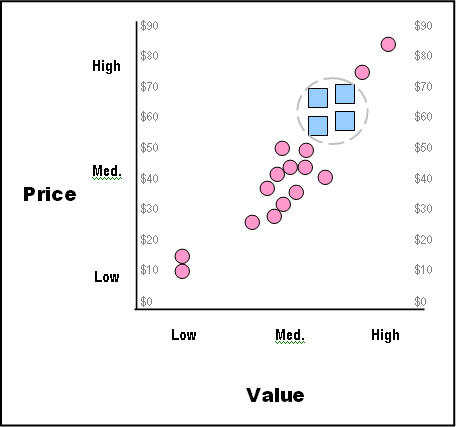 Option 5 – Offer several products or services across several price points: You can position several products of varying value and varying price points so that customers looking for a specific price or specific value will be more likely to buy. This is a strong, long-term play and a lot of entrepreneurs end up here. Start with one or two and then slowly add more over time. It doesn’t always have to be a higher or lower value offering of the same thing. You might offer a low value, low priced product and a high value, high priced service. Option 6 – Eliminate the competition: Maybe there’s a way to position your product so that you eliminate some of the potential competition in your customer’s mind. (For example, you might narrow your niche slightly, making your product more relevant and your competitor’s market less relevant to a tightly defined group of people). The strength of this method is not in your product or service but rather in your marketing. It can work really well and it’s probably my favorite of all the options. It also allows you (generally) to ask for a higher price. The level of value between one and another isn’t that different. After you’ve eliminated some because of what I’ve listed above, you still might end up with a few and you will still need to reduce that number a bit… but you’re getting closer and you’re not talking about a few dollars of difference. Narrow down your choices to just a couple of price/value points. Continuing with my example from earlier, I’ve determined that all but two of the potential price points were worth considering. Return on effort: Is the price increase between your options worth the effort of adding value? To illustrate, consider the example I’ve been using: Is it worth my time and effort to bring the product from the medium-high to high level just to achieve the additional price jump of $10 per product? Use both: If you’re at this point and can’t decide, think about offering both price points. Test: If you don’t want to offer both price points for whatever reason, consider testing both to see which one does better. In my example, I might drive some traffic to a landing page offering the medium-high value $59 product and other traffic to a landing page offering the high value $69 product and see what happens. Increase urgency: Start at the lower side of your price/value range (in my example, I’d start at $57) and tell readers that the price will increase slowly over the next couple of weeks and then I would slowly raise the price – but also the value – from $57 to $69. At this point, you’re going to be pretty close to the price. Of course, things might change. There might be another competitor who swoops in and offers a lower-priced/higher-valued product in the same space you’re offering. Or the marketplace or economy could change and put pressure on you to lower the price or increase the value. But this tool will help you to quickly and easily find a target price for your offerings. PS, want to read more about pricing? 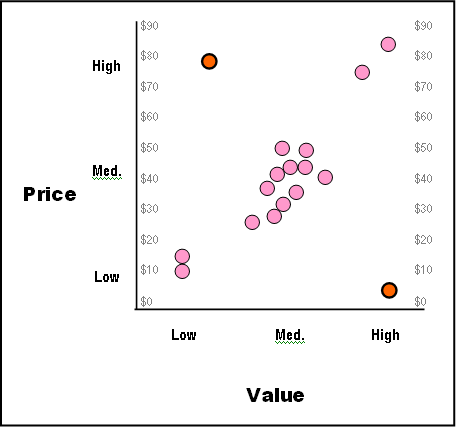 My blog post on price and pricing strategy might help.